It’s official. 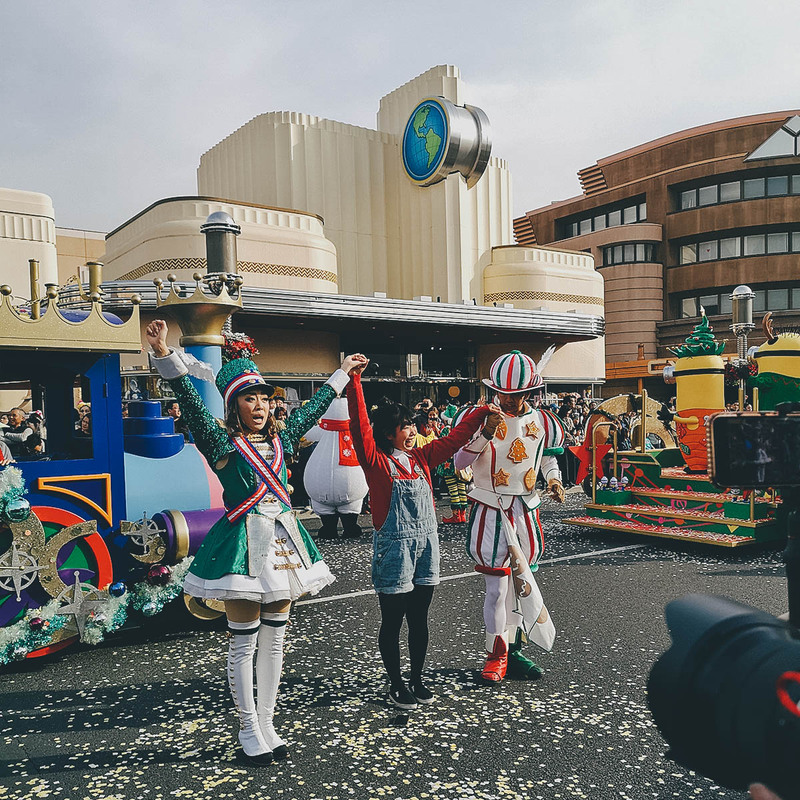 Universal Studios Japan™ is the most magical place on earth. At least in our universe. The last time I went to Universal Studios Japan™ was in January of 2017. 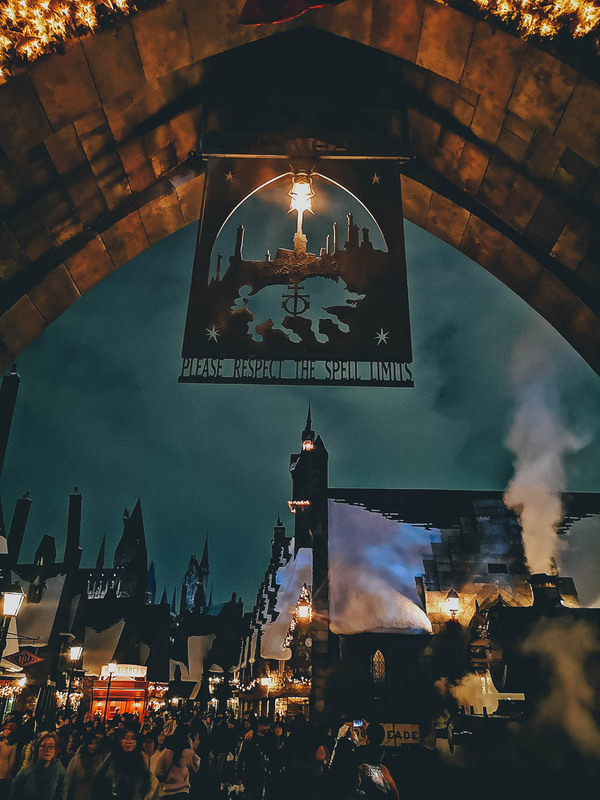 It was my first time visiting a Universal Studios™ theme park in thirty years, so naturally, the experience felt fresh and new to me. But it’s been less than two years since then, so with that last experience still relatively fresh in my mind, I expected this trip to be less exciting and more “been there done that”. But it wasn’t, not by a long shot. If anything, it was even better and more exciting than that visit from nearly two years ago. As I learned today, it doesn’t matter how old you are or how many times you’ve been to Universal Studios Japan™. This place will always, ALWAYS be fun. Woohoo! We’re at Universal Studios Japan™! Ren wasn’t able to join me in 2017 so it was great having her with me today. 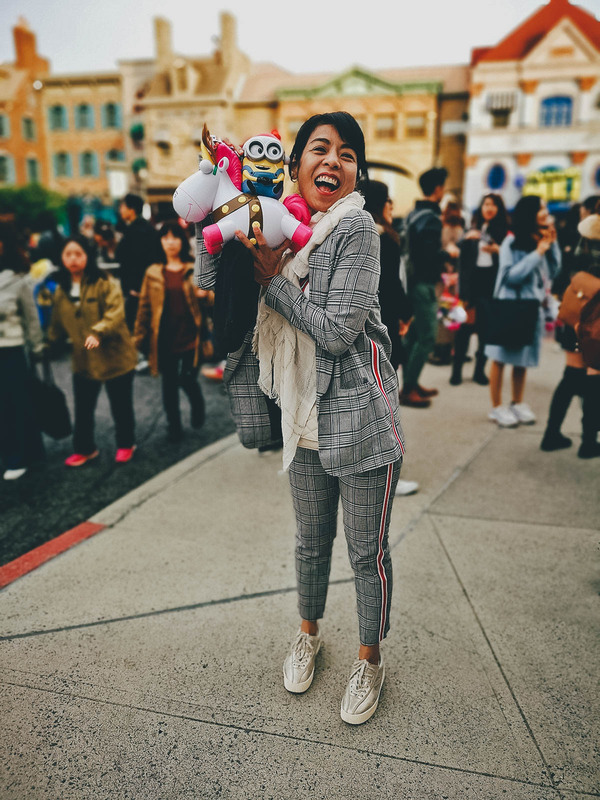 This was her first time visiting a Universal Studios™ theme park in about twenty years, since Universal Studios Hollywood™ in the late 1990s. 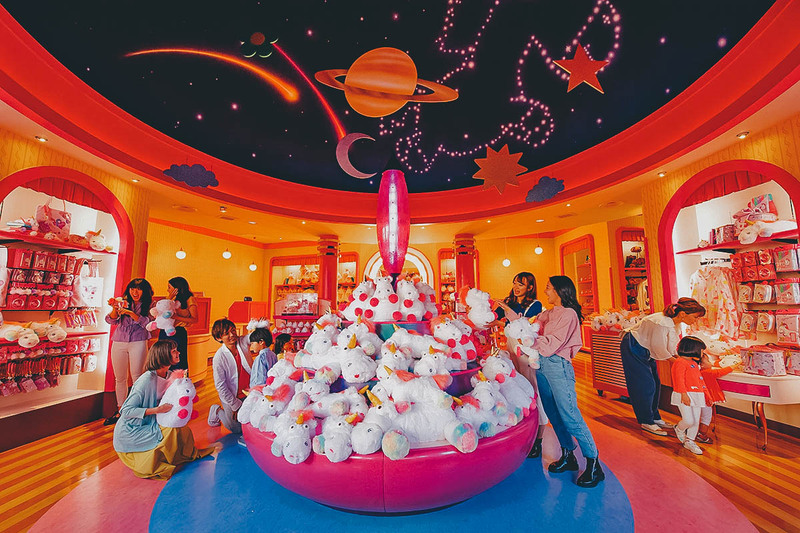 As of this writing, a one-day pass to the park costs JPY 7,400 for adults and JPY 5,100 for children ages 3-11. To beat the lines, you can purchase your tickets in advance through KKday. Here we are doing the mandatory pose in front of the Universal Studios™ globe. It’s located just inside the main gate. 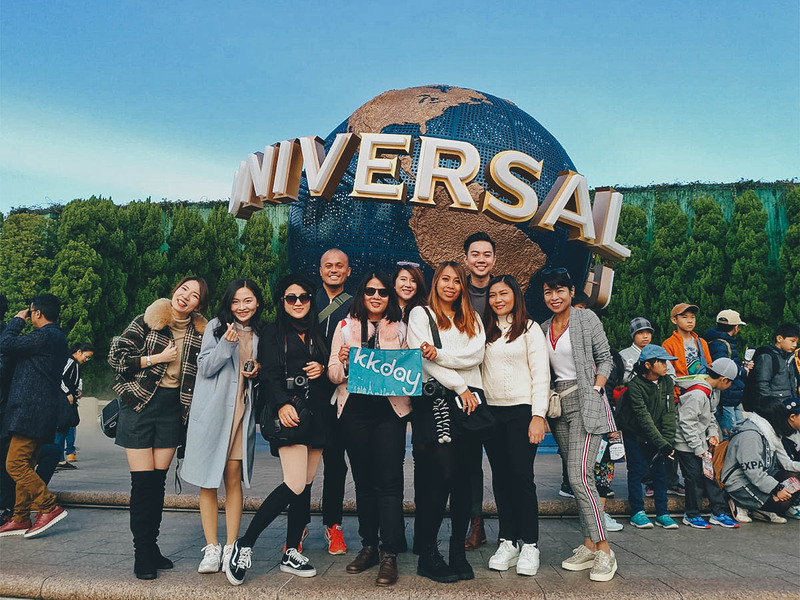 We were here today with a fun bunch of KKday bloggers and social media influencers from the Philippines, Malaysia, Vietnam, Thailand, and Singapore. 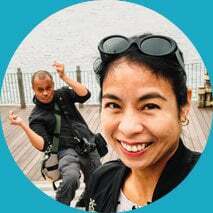 Shout out to fellow Filipino and one of the best travel bloggers/vloggers out there today, Aileen Adalid of iamaileen.com! She was here today with her sister Grace. Like that press trip from two years ago, we were here on a regimented schedule so everything was go go go! For our first stop, our guides took us to the Studio Gifts East shop which had all these fun holiday-themed merchandise. Aren’t these Minion cookie jars the cutest?! They were filled with Minion-themed shortbread cookies. Aaaaagh…too much kawaii! 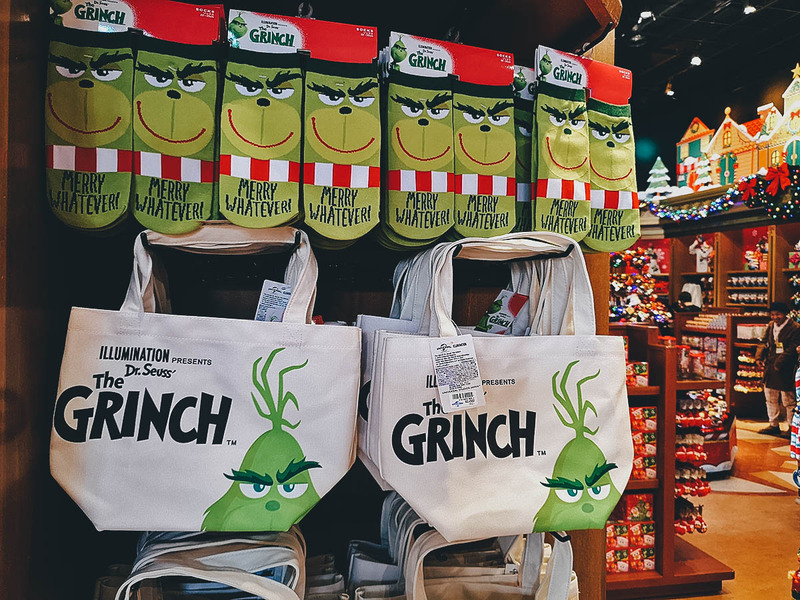 I grew up reading Dr. Seuss so I fell in love with all this merchandise from The Grinch. Aren’t those socks awesome? If we had more time, then one of these hoodies may have come home with me. 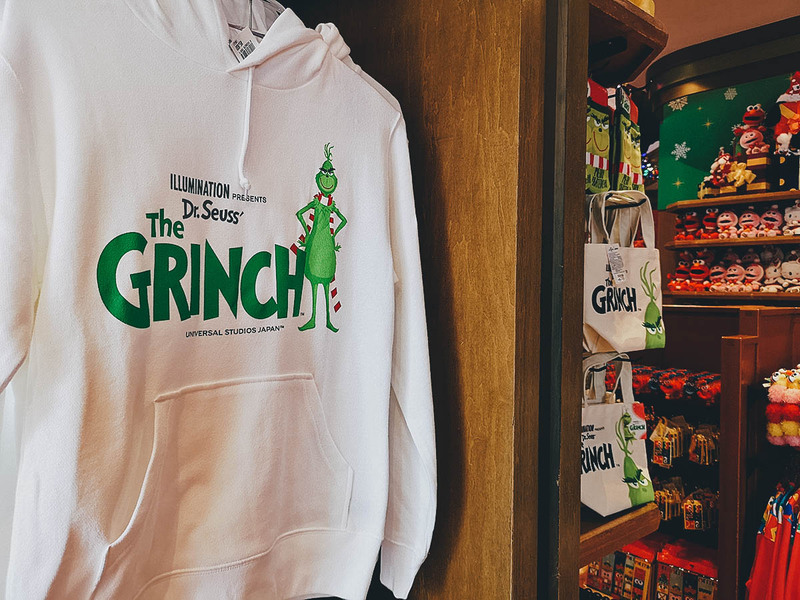 They had them in Grinch green as well, but imagine if they had it in a fuzzy green version too? Want! 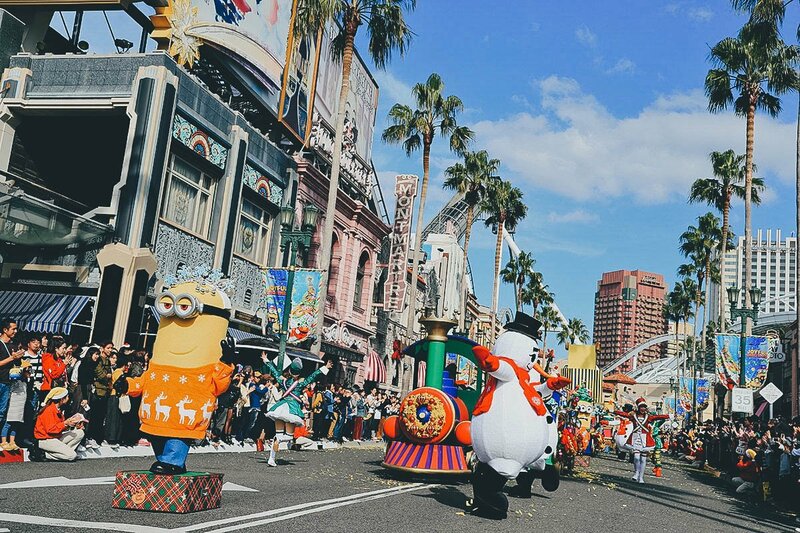 We left the Studio Gifts East shop just in time to catch this Minion Hacha-Mecha Christmas Party parade. 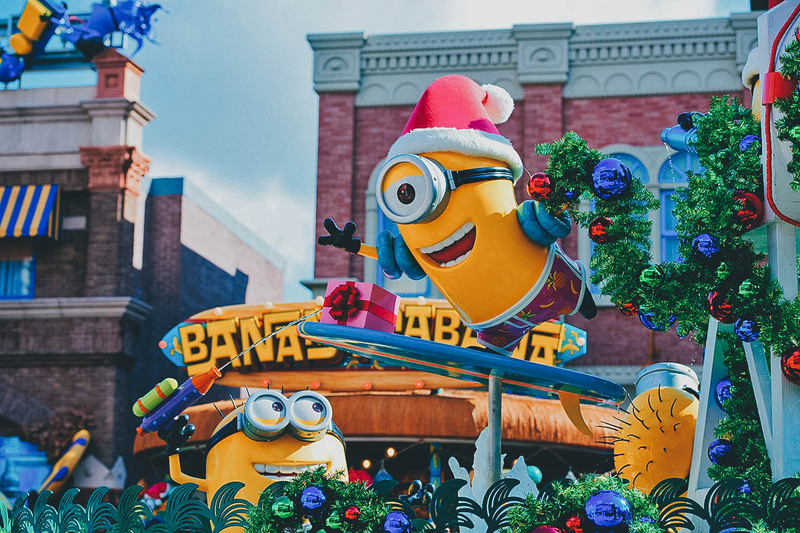 According to our guide, the parade was inspired by a Christmas party planned by the Minions. 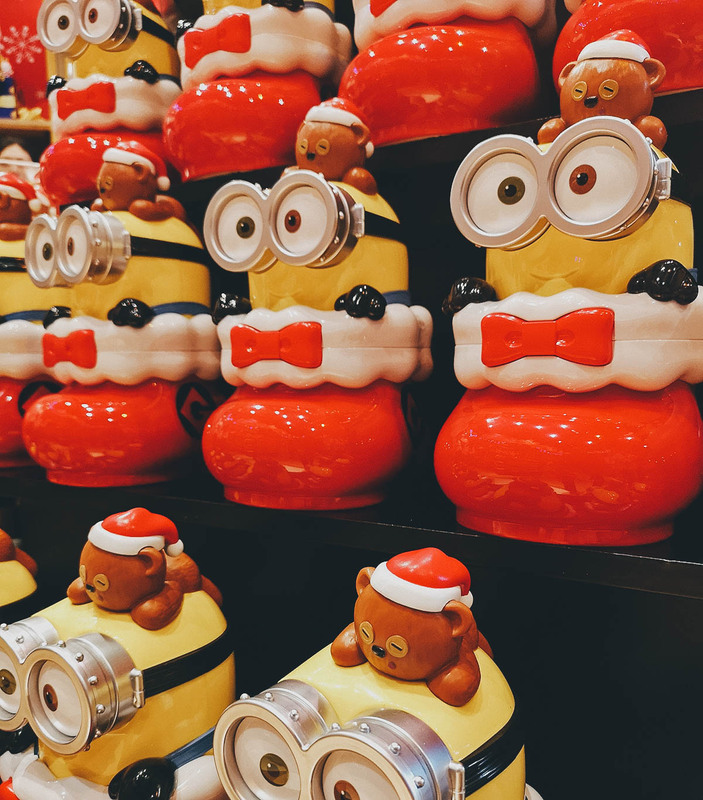 If the Minions were to organize a Christmas party, then what would that party be like? They take people from the crowd and invite them to dance. Ren was so wishing they’d grab her! There’s supervillain Gru. I wonder if Steve Carell is inside? Towards the end of the parade, they allowed park-goers to get close and pose with the characters. 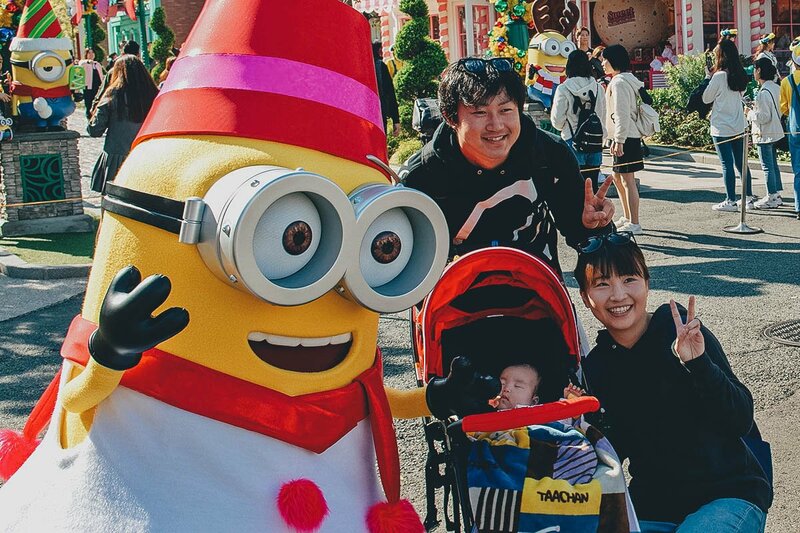 Would have been cool to get a selfie with a Minion! This Despicable Me Minion Mayhem attraction was one of two rides we experienced today. It’s meant to simulate what it’s like to become an actual Minion. We were strapped in to a vehicle that stays in place but vibrates and jostles back and forth while a 3-dimensional movie is projected onto a massive dome screen. It really does feel like you’re taking a ride through Gru’s laboratory. Fun! 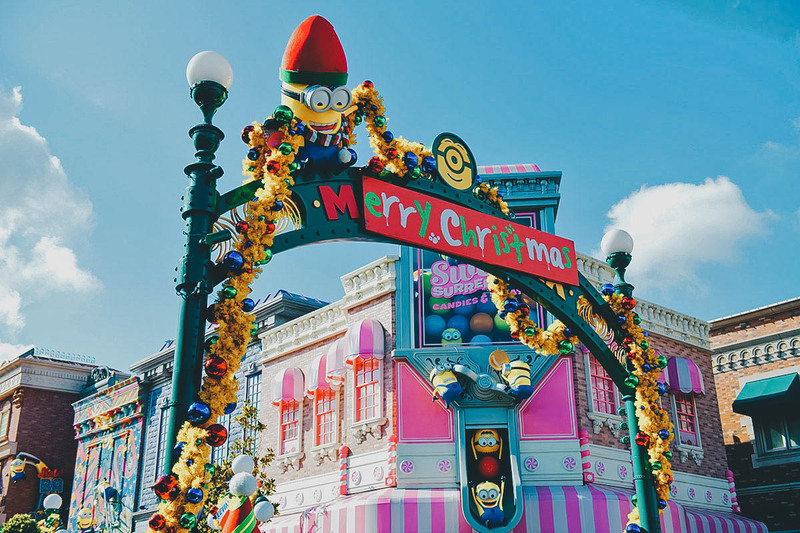 There were so many cute Christmas-inspired Minion decorations in this area of the park. This entire Minion section opened in April of 2017 so none of this was around on my last visit. It’s amazing how they can keep closing and opening new attractions to make a theme park of this magnitude fresh and fun. The amount of work that goes into running a place like this is mind-blowing! I’m ashamed to admit that I haven’t seen any of the Minion movies. Sad but true. Only on this trip did I learn that bananas are their favorite food, which is why you’ll find a few banana-inspired booths at the park, like that Banana Cabana in the back. There were even bananas hanging from the Christmas decorations! 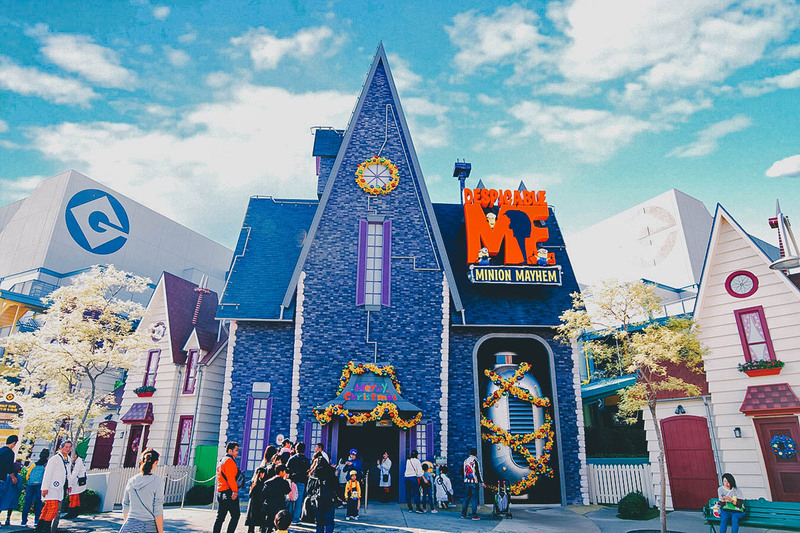 The rides aren’t the only thing that’s fun at Universal Studios Japan™. The food is a blast too. 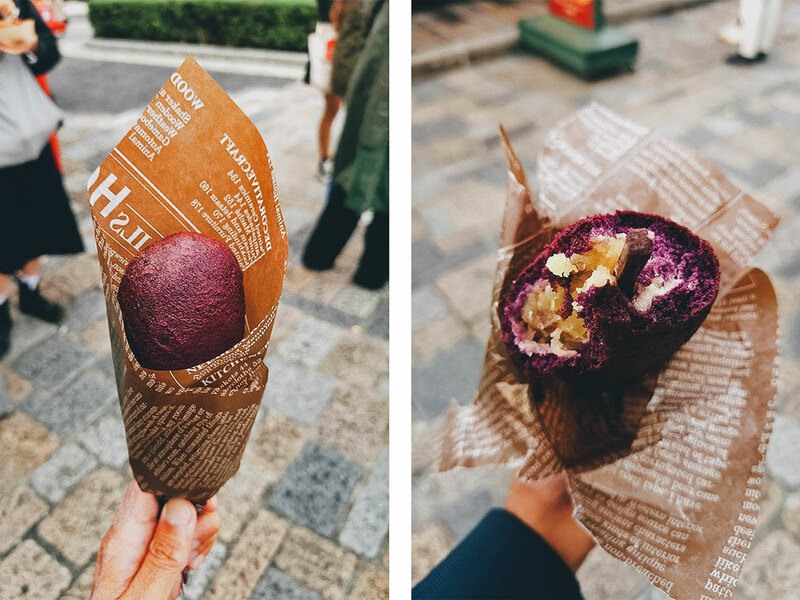 We’d try several snacks today, starting with this sweet potato corn dog. It doesn’t have an actual hot dog inside but it’s delicious and unique! 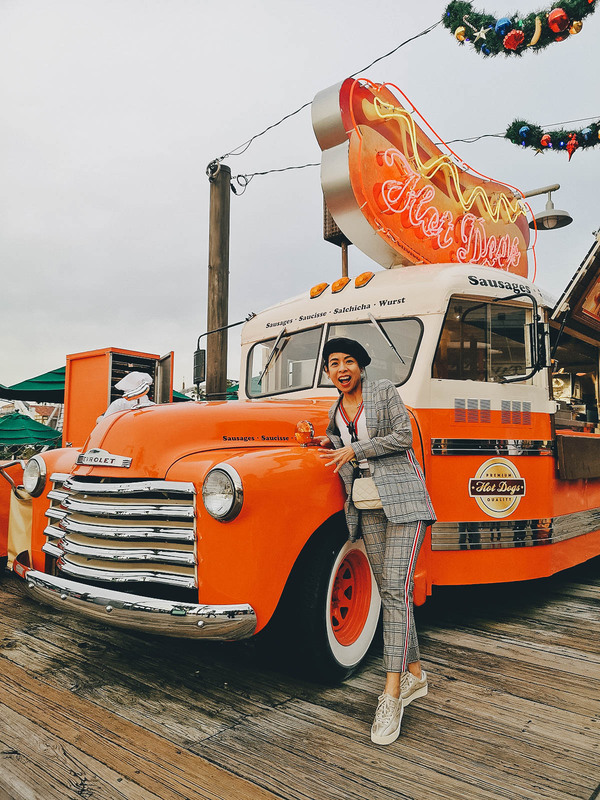 Check out this funky hot rod turned hot dog food truck! Everything we had today was delicious, but this Italian-style oden was our favorite. Oden is a Japanese one-pot dish traditionally made with boiled eggs, daikon, konjac, and fishcakes in a light, soy-flavored dashi broth. But this Italian-style oden had sausage, pancetta, basil, and other ingredients in a rich, tomatoey broth. As you can tell from Ren’s expression, it was absolutely delicious and perfect for this cold November day. Isn’t this adorable? 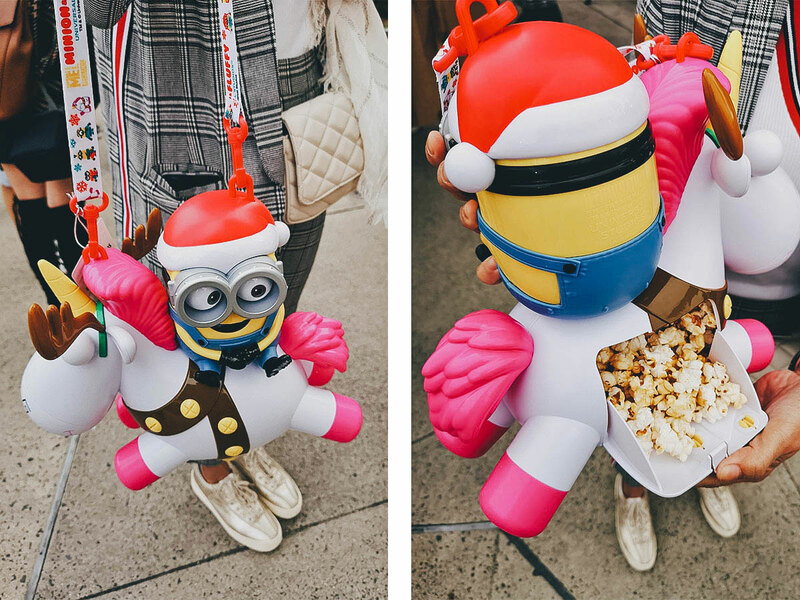 They gave each of us these super cute Minion and Fluffy popcorn buckets. Ren was so giddy with excitement when they brought these out. They’re filled with popcorn! In keeping with the Minion theme, they contained not just regular butter or caramel popcorn either, but banana-flavored popcorn which we’ve never had before. It was sooo good! Our next stop was this Delicious Me! shop selling strawberry shortcake Minion cookie sandwiches and Fluffy hot chocolate drinks. Both were delicious and a lot of fun. 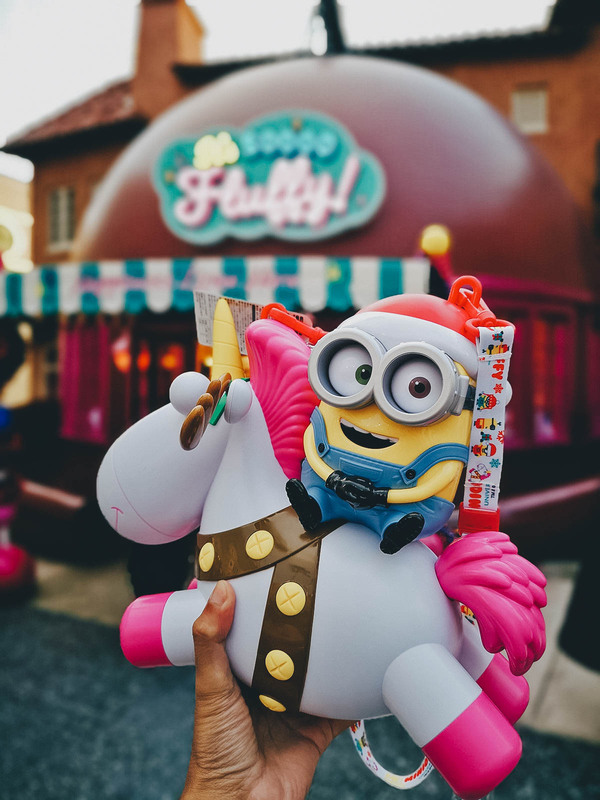 Like I said, I haven’t seen any of the Minion movies but Fluffy the Unicorn is apparently a character from the third installment of the Despicable Me movie franchise. It’s Soooo Fluffy is a store that carries different types of Fluffy-related merchandise. Everything is so pink and well…fluffy! 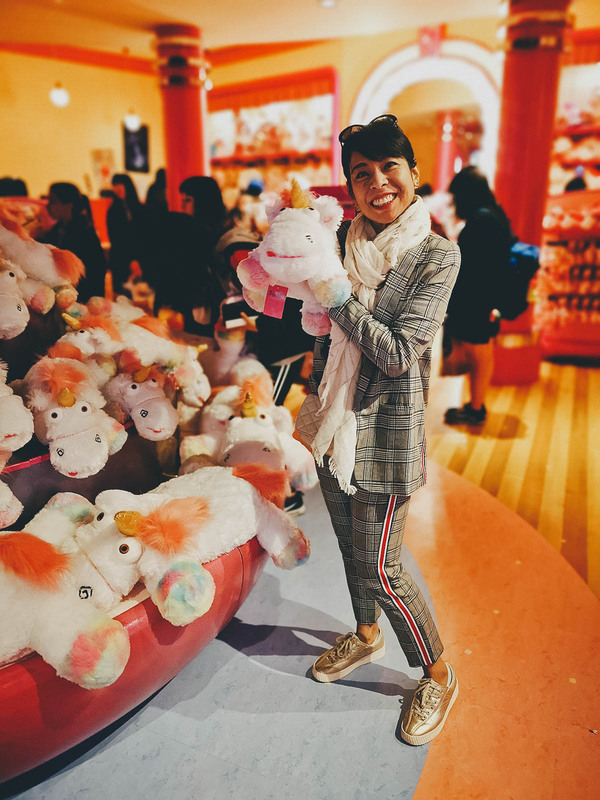 If you like cute unicorns, then you’re going to love this shop. 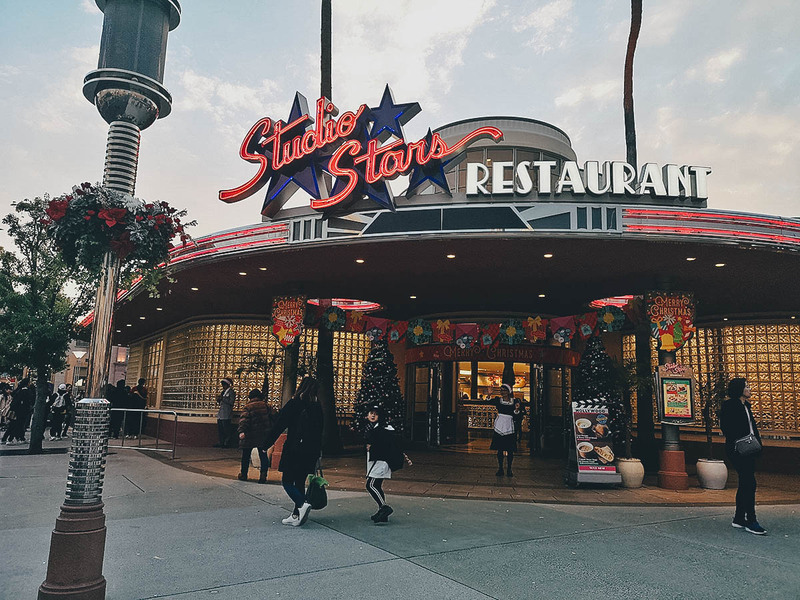 All this cuteness was making us hungry so we stopped at the Studio Stars Restaurant for dinner. What’s for dinner? 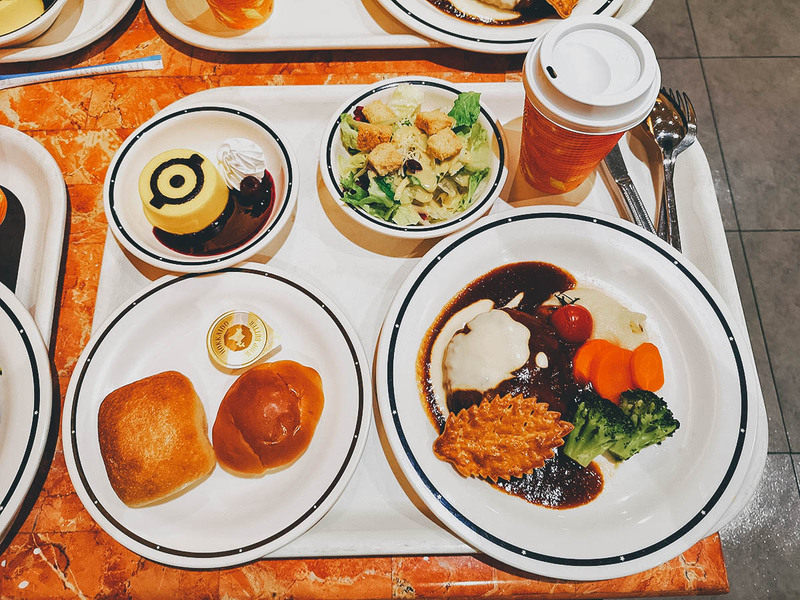 Japanese Hamburg steaks, Caesar salad, dinner rolls, and of course, a Minion-inspired dessert. Can’t have enough of those Minions! 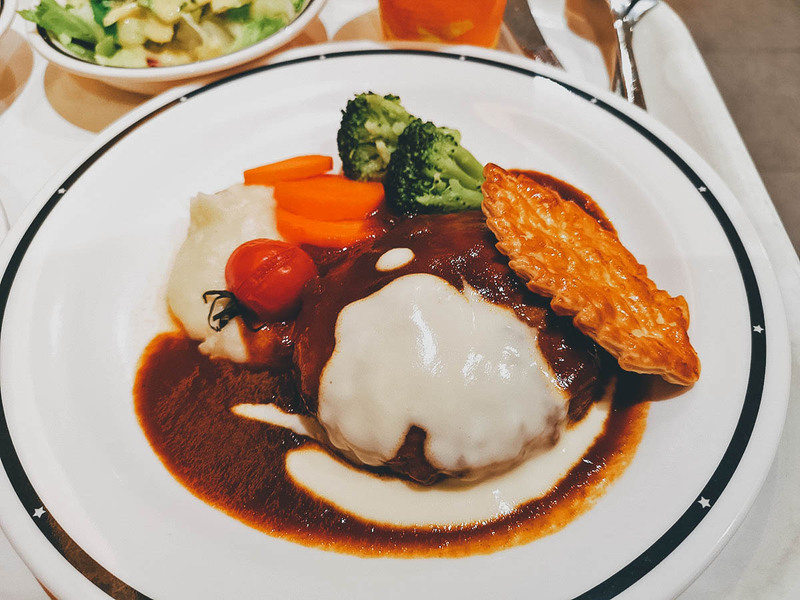 This Hamburg steak smothered in Japanese curry was absolutely delicious. From what I understand, Japanese-style curry was inspired by the British during the Meiji era when India was under their colonial rule. It’s become so popular that it’s now considered a Japanese national dish along with sushi and ramen. Night had fallen when we left the restaurant, setting the stage for this fantastic light show called The Gift Of Angels III, which was the first of three we’d be watching tonight. Our guide explained that this season’s string of performances – from 9 November 2018 till 6 January 2019 – would be the last in this show’s ten-year run. They’ll be creating a brand new light show for next year. 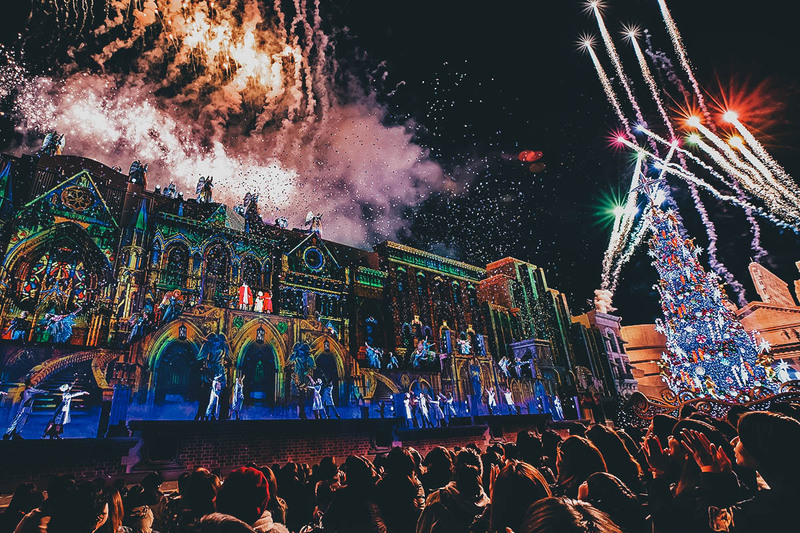 The light show is projected onto the side of this set of buildings while actors perform skits and dance to the music. It’s pretty spectacular and unlike anything I had ever seen before. Check out that gigantic Christmas tree! The light show starts off fairly slowly at first, before building up to this dazzling climax complete with fireworks and a hailstorm of confetti. Awesome! If I remember correctly, the show lasted about 30-45 minutes. Speaking of fireworks, you can celebrate New Year’s Eve at the Universal Studios Japan™ countdown party. We haven’t experienced it ourselves but based on the reviews, it’s a spectacular event highlighted by a stunning fireworks display, probably even larger than this one. 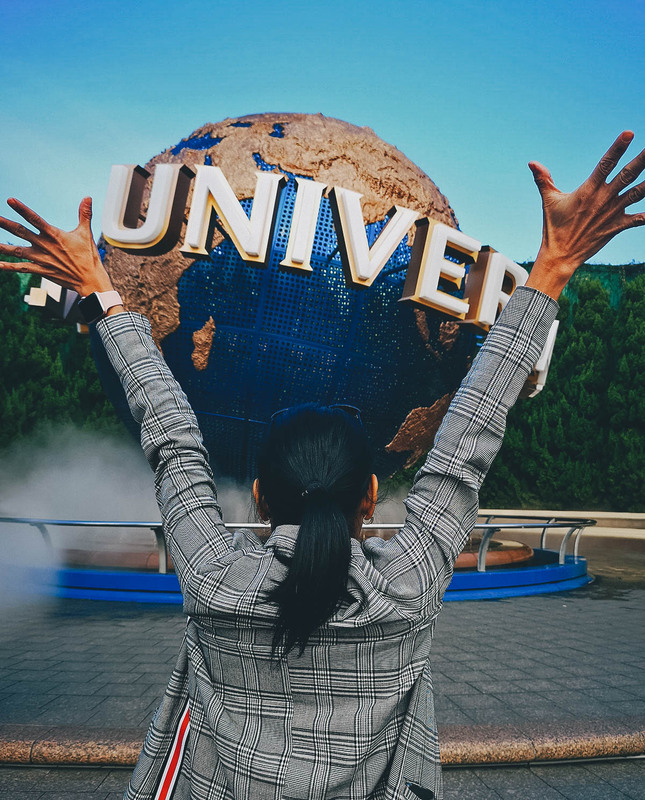 You can follow the link for more information and to purchase tickets to the Universal Studios Japan™ Countdown Party 2019 through KKday. After the light show, we rushed to The Wizarding World of Harry Potter™ which is my favorite part of Universal Studios Japan™. This place looks absolutely magical during the day with its themed shops and film-inspired setting. It really does feel like you’re in the Harry Potter universe! 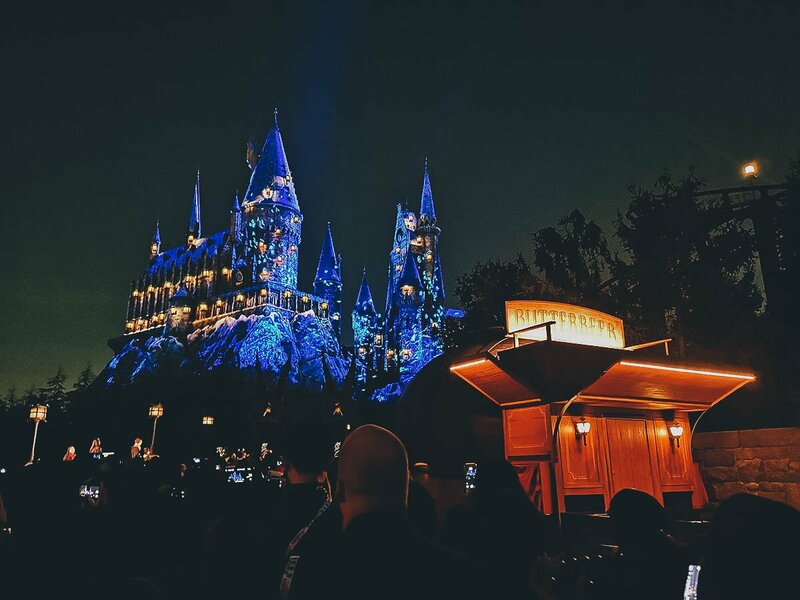 Here we rode one of the park’s most popular attractions – Harry Potter and the Forbidden Journey™. I went on this ride in 2017 and I was blown away by it. Tonight was Ren’s first experience and she was equally impressed by it. It’s incredible how much theme park rides have progressed in twenty years! 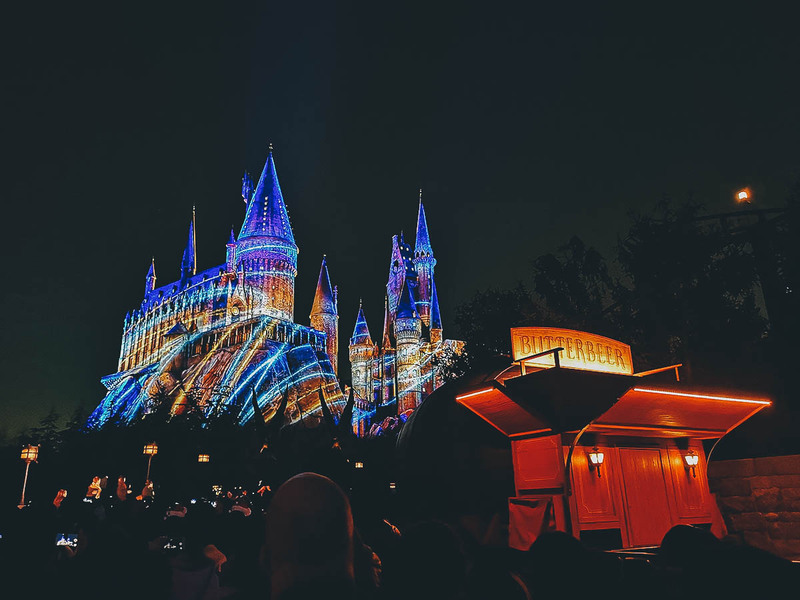 After getting off that flying broomstick of a ride, we stood outside Hogwarts™ Castle to watch this incredible light show called Hogwarts™ Magical Nights – Winter Magic. I didn’t think anything could top The Gift Of Angels III but this one did. They turned the entire castle into a gigantic 3D projector screen. It was INSANE and something I had never ever seen before! The castle would turn different colors with characters from the film franchise being projected onto its facade. The light show was accompanied by music and voiceovers that made for a stunning, almost surreal experience. I couldn’t believe what I was watching! 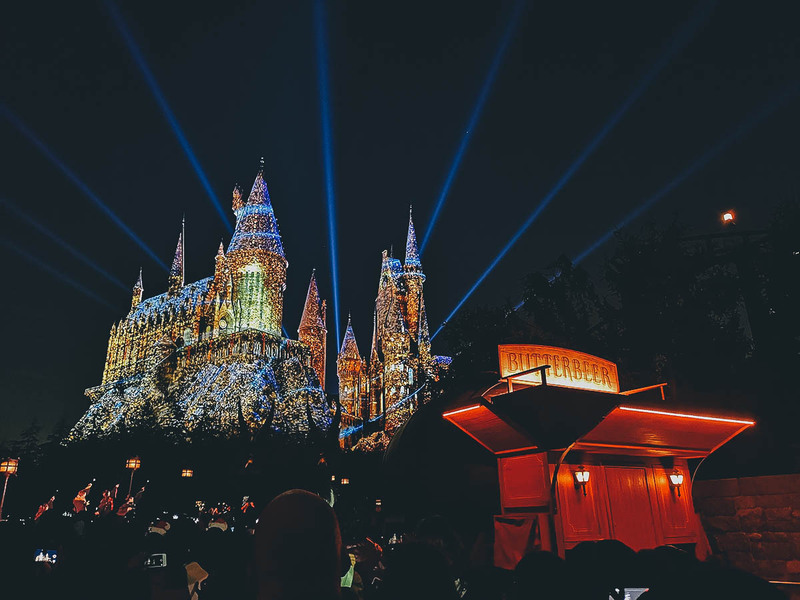 Hogwarts™ Castle bursting with light and magic! 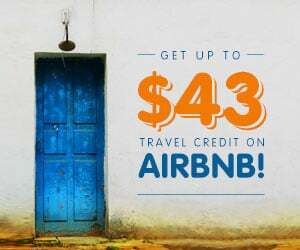 What a way to celebrate the holidays! 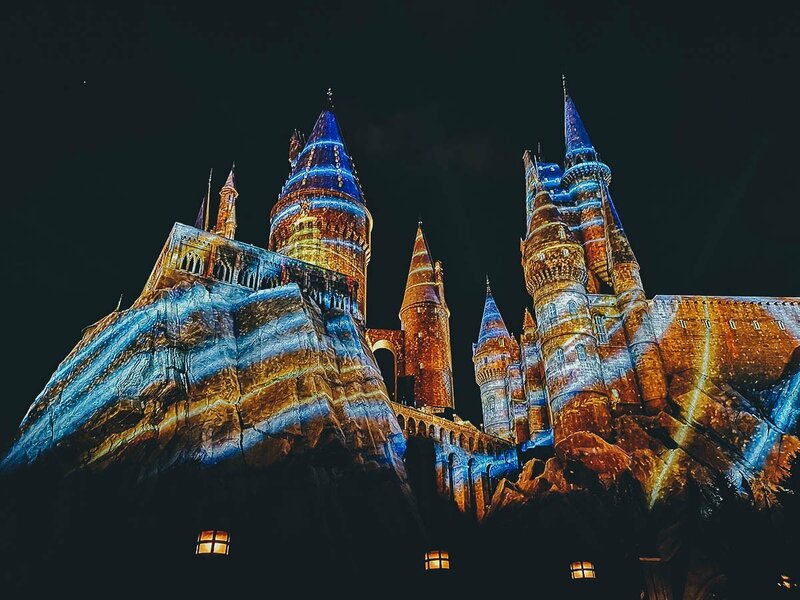 This Hogwarts™ Magical Nights – Winter Magic light show will only run till 28 February 2019, so I strongly urge you to watch it if you’ll be in Osaka during that time. It is absolutely breathtaking and one of the highlights from our visit to Universal Studios Japan™. Seriously, WOW! Incendio! This interactive attraction that simulates spell casting was fun. Do you see the light shining through that narrow window? It’s a sensor that monitors your wand’s movements. 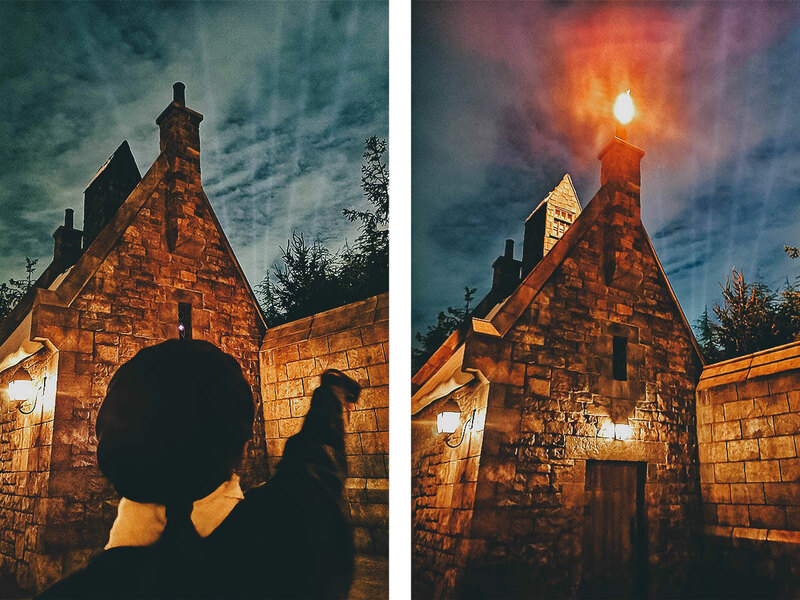 You have to stand in a certain spot then wave the wand in a specific way to get the chimney to spew out flames. To complete the illusion, you’re asked to shout out “Incendio!” while waving the magic wand. Ok, I’m running out of superlatives here. First, The Gift Of Angels III takes my breath away. 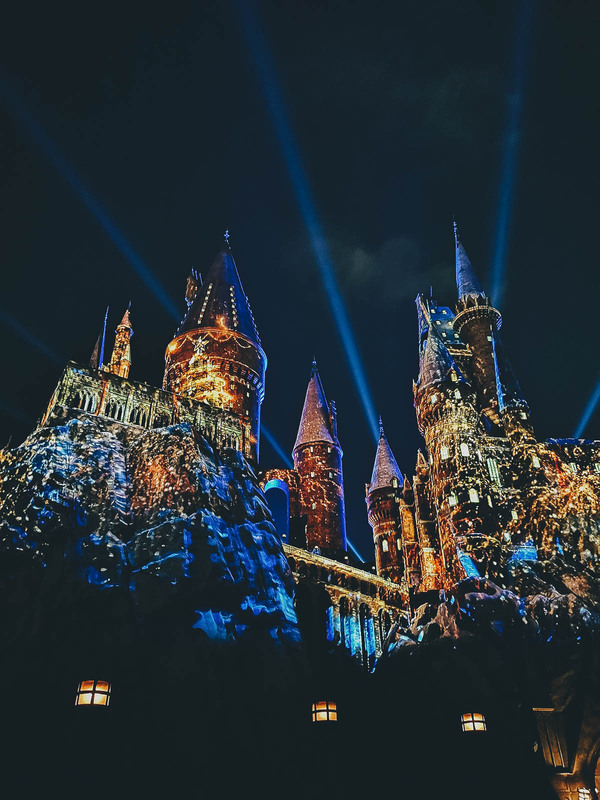 Then Hogwarts™ Magical Nights – Winter Magic blows me away. Just when I think I’ve run out of oohs and aahs, we sit down by the side of the curb and see this parade. 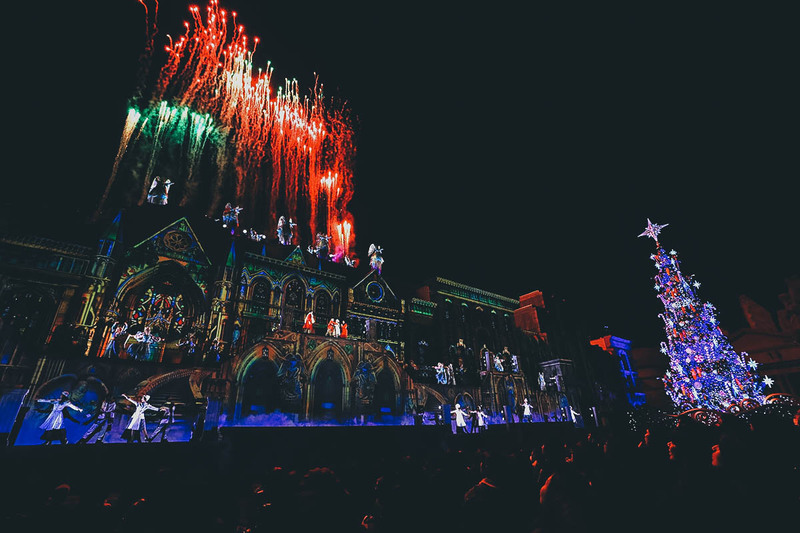 Called the Universal Spectacle Night Parade: The Best of Hollywood, it features floats from four major movie franchises – Harry Potter™, Jurrasic World™, Transformers™, and Despicable Me™. I thought I’d seen it all with the previous two light shows but this one topped them both. It is without a doubt the BEST PARADE I have ever seen in my life. As described, this parade features the most mind-blowing floats from four major movie franchises. It’s highlighted by life-sized mechanical replicas of popular characters like Bumblebee from the Transformers™ and a Tyrannosaurus Rex from Jurrasic World™. There were actors running around as velociraptors and wizards fighting warlocks in complicated choreographed displays. Buildings on either side of the street were turned into makeshift projector screens with lasers being fired in every direction. It was about an hour of wide eyes and wows that left me open mouthed but speechless throughout. I simply could not believe what I was seeing. 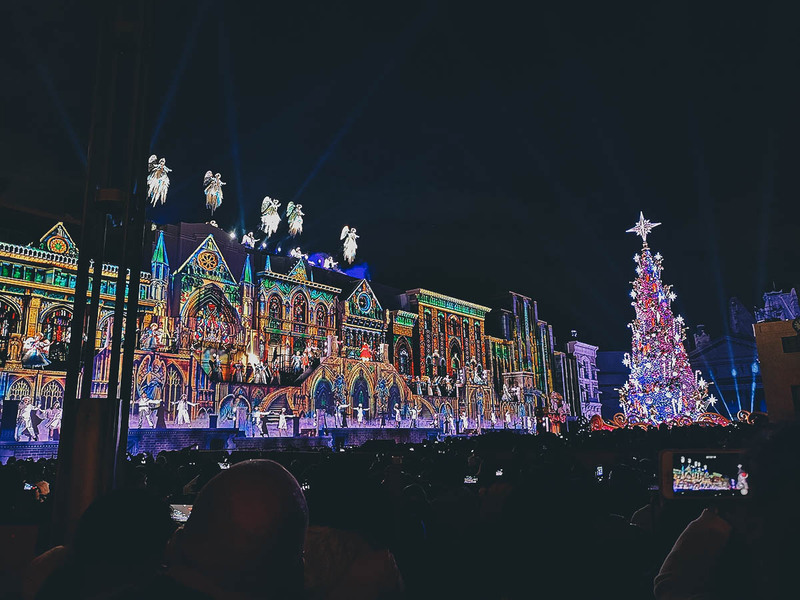 Like the previous two light shows, you absolutely need to see this parade, more information for which you can find on the Universal Studios Japan™ website. I feel like I’m hyping it up too much, but I can’t help it. It’s by far the best parade I’ve ever seen in my life. 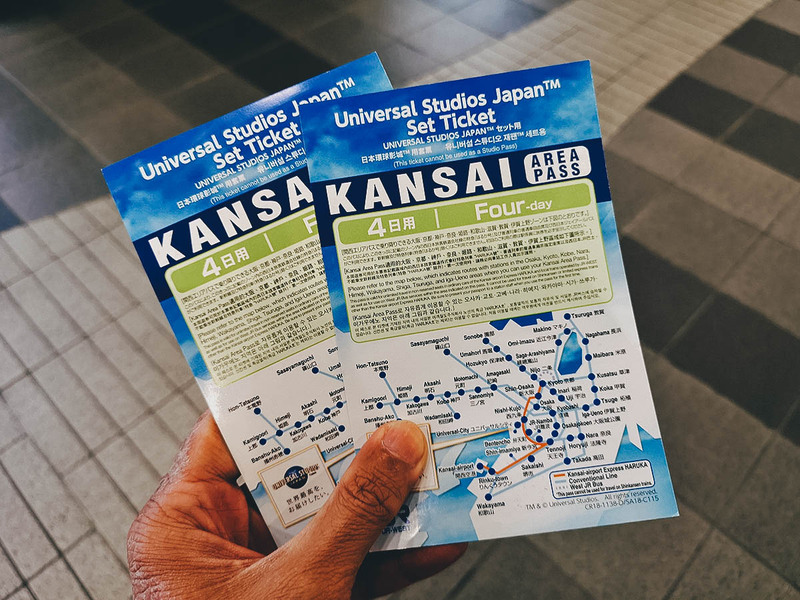 As if our visit to Universal Studios Japan™ wasn’t awesome enough, they provided us with these JR Kansai Area Passes that entitled us to unlimited travel on JR trains for four consecutive days. 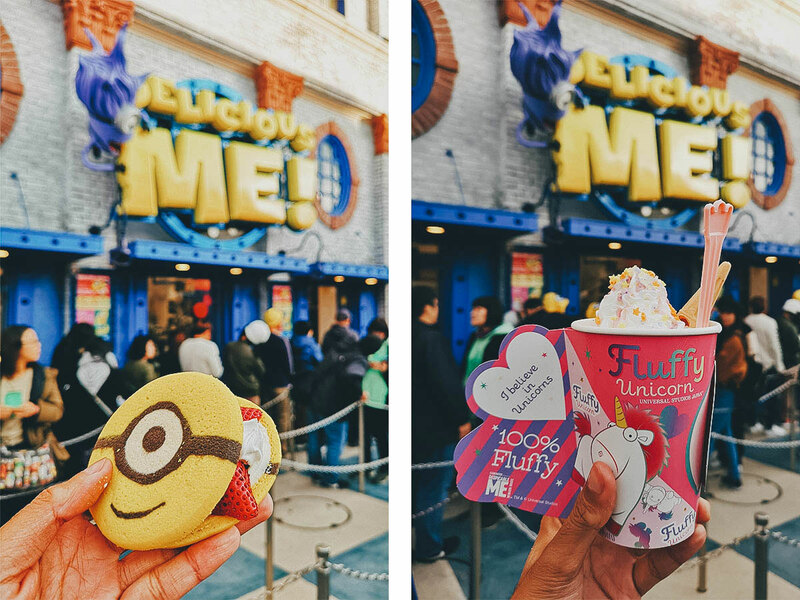 Available on KKday, you can get them conveniently bundled with a one-day pass to Universal Studios Japan™. We used our passes to visit Nara and Kyoto. There’s Ren excited to explore more of the region thanks to our JR Kansai Area Passes. Arigatou gozaimasu! As described at the top of this post, I learned today that Universal Studios Japan™ will always be fun no matter how many times you’ve been. There’s just so much to experience at the park, plus they keep it fresh by regularly introducing new attractions. Even if you don’t go on any rides, you’ll still have fun from just checking out all the themed shops. In fact, that’s exactly what Ren and I would have done with more time. I would have loved to explore every shop at the park, especially the ones in the Harry Potter™ section. 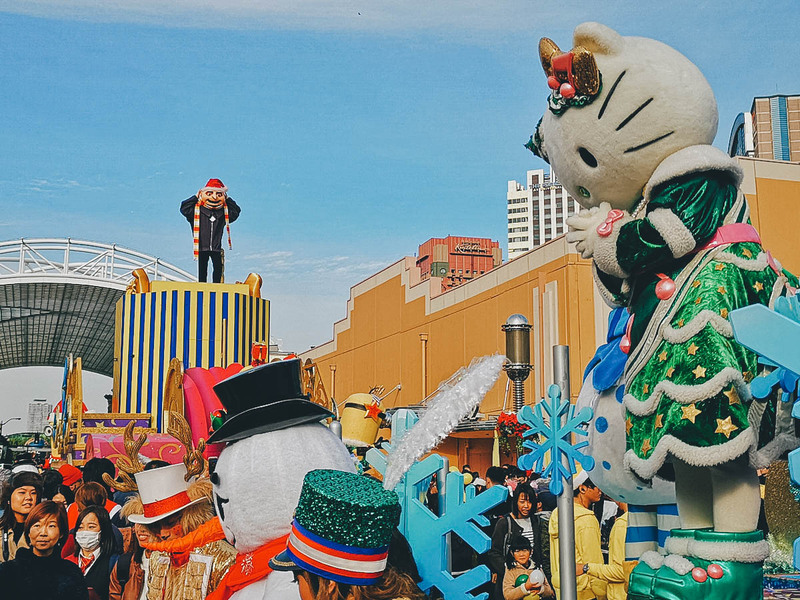 Universal Studios Japan™ is fun any time of the year, but I strongly urge you to go if you find yourself in Osaka over the holidays. 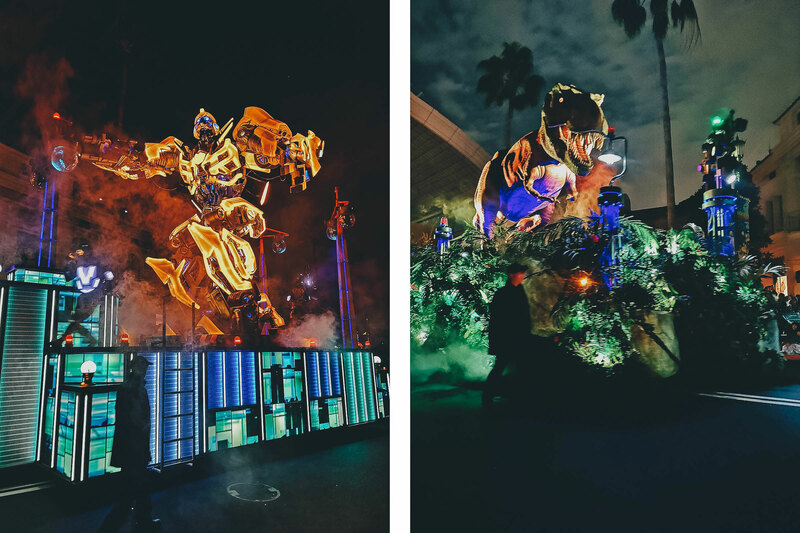 The light shows and parades are spectacular and not something you can experience any time of the year. They definitely made our visit that much more special. You can pay for admission at the gate but if you want to beat the lines, then you can purchase advanced tickets through KKday. 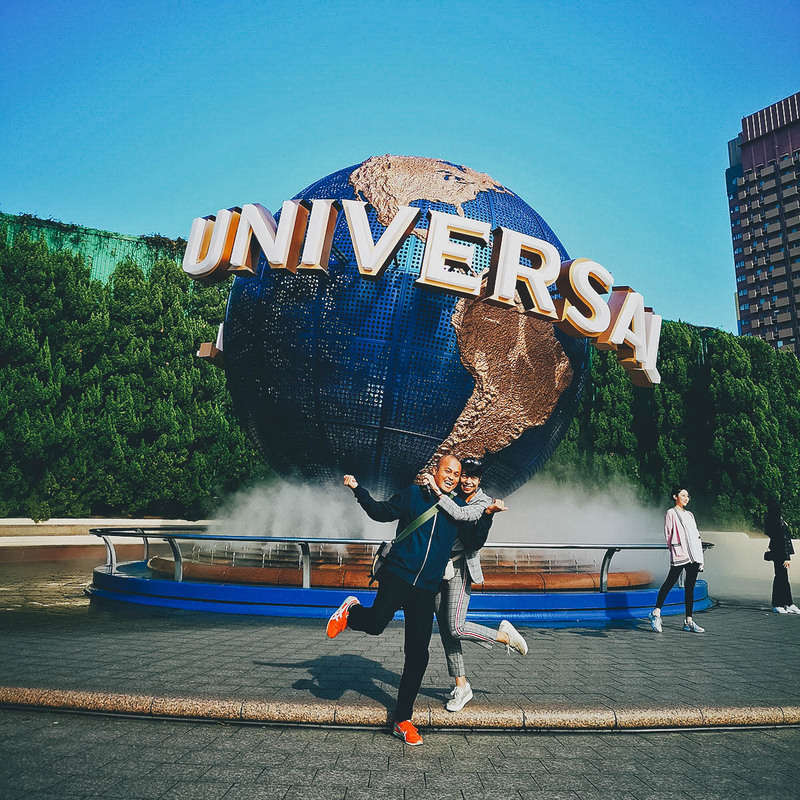 You can get just a Universal Studios Japan™ ticket, or you can get a Universal Studios Japan™ ticket / JR Kansai Area Pass bundle. 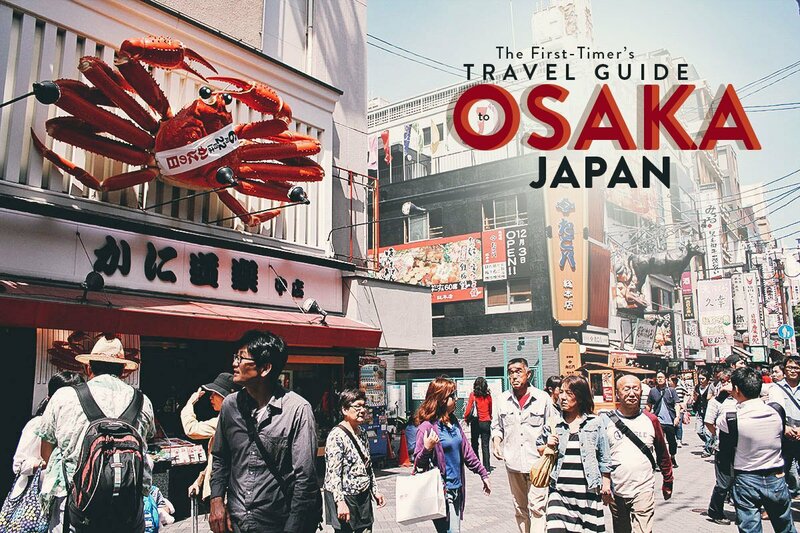 Many tourists visit Kyoto and Nara on the same trip to Osaka so the latter will come in very handy. And if you happen to be in Osaka for the new year, then you may want to attend the countdown party on the 31st of December. 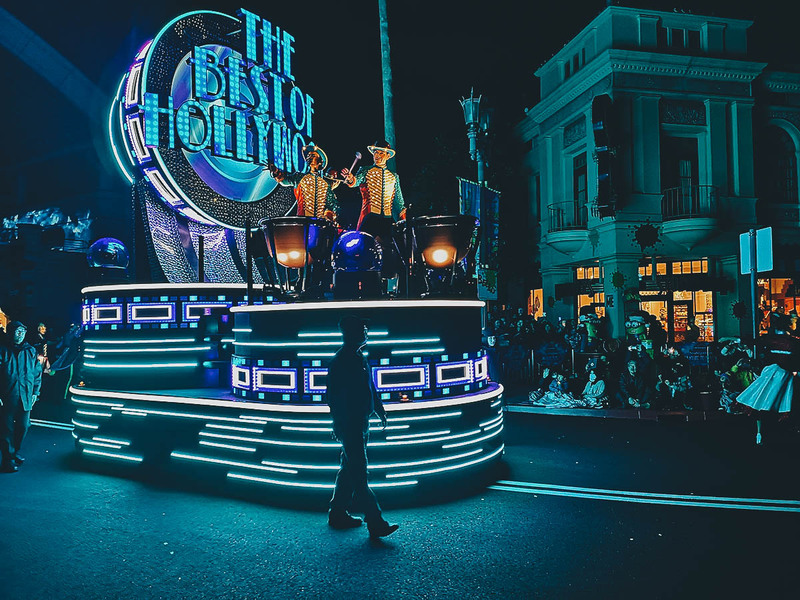 We’ve never been, but if the light shows and parades are any indication, then that party will be absolutely incredible. Follow the link for pricing information on Universal Express Passes. We were here as guests of KKday and Universal Studios Japan™. 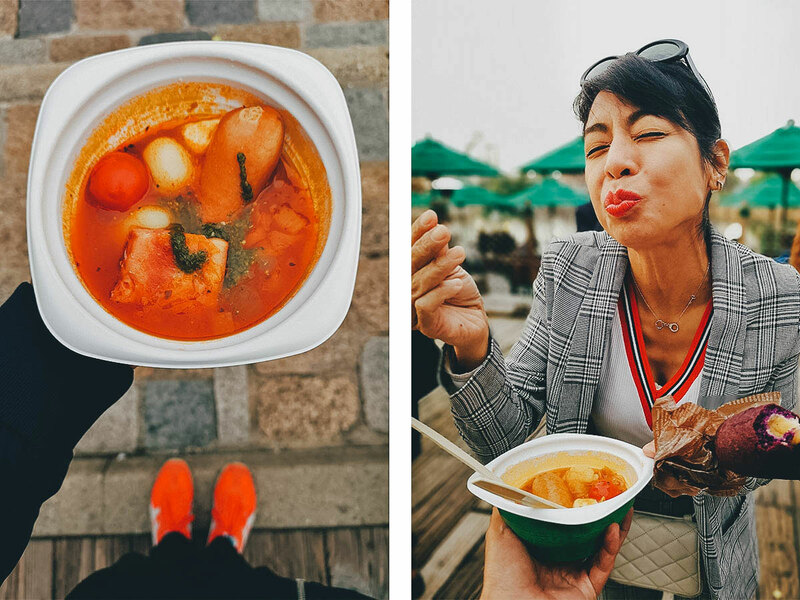 We were given free admission to the park, complimentary food and drinks, and JR Kansai Area Passes in exchange for an honest account of the experience. As always, all thoughts, words, and opinions expressed in this post are mine and mine alone.